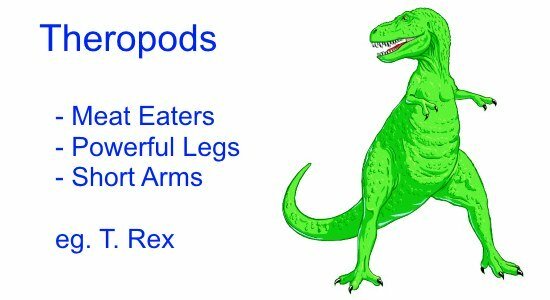 What are the different types of Dinosaur species? 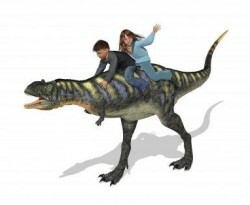 Dinosaurs lived between 250-65 million years ago. They had straight legs tucked underneath their bodies. 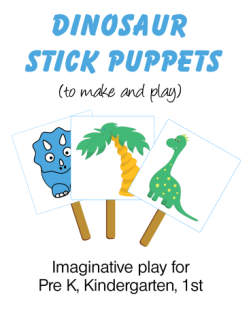 Within these basic rules, scientist group dinosaurs into different categories. 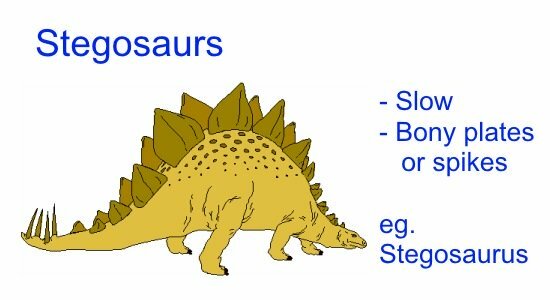 Of the two main types of dinosaurs, the most important difference is in the shape of their hip joints. 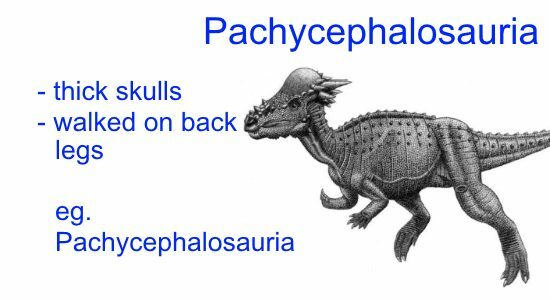 Dinosaurs with pelvic hips (like lizards) are called Saurischia. The second group, Ornithischia, are those with with hip bones more like birds. 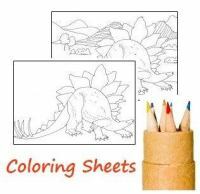 To see which dinosaurs belong in each group, see the list of different types of dinosaurs. 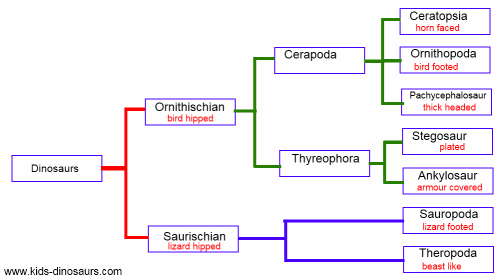 Saurischia are divided into two main groups. Theropods - meaning 'Beast foot'. They are the only meat-eating group of dinosaurs. They walked on three-toed bird like feet with sharp claws. They had powerful legs and short arms. There is a sub-group of these dinosaurs called Coelurosauria that contains dinosaurs closely related to birds. Most feathered dinosaurs discovered so far have been in this group. 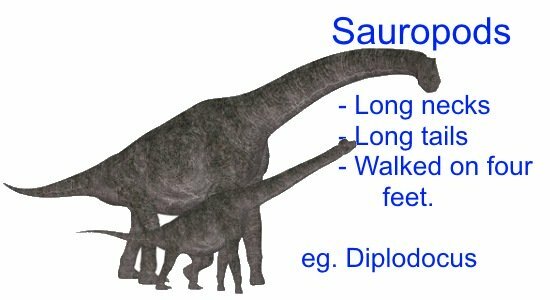 Sauropods - lizard footed reptiles. These are the really large herbivores. They walked on all four feet, had small heads and long necks and tails. Ornithischia are firstly divided into two groups, with a total of five main subgroups. All of the dinosaurs in this group were herbivores. The Stegosaurs (plated or roofed reptiles). These were slow moving medium sized dinosurs that moved on all fours. 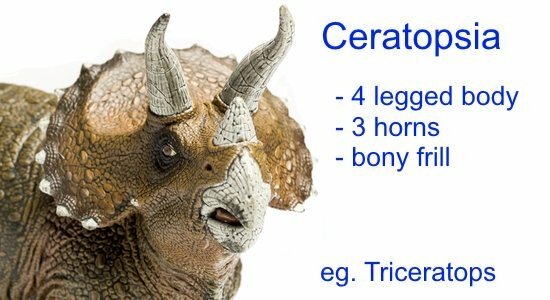 Their skins were covered in bony plates or spikes. 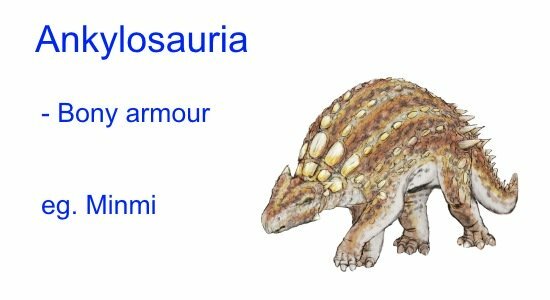 Ankylosauria (armour covered or 'fused together' reptiles). Small to medium sized dinosaurs. Their bodies were covered in flexible bony armour of slabs or plates. 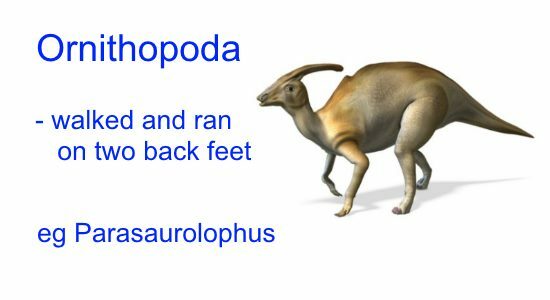 Ornithopoda (Ornithopods) meaning bird feet. Small to very large dinosurs that that walked and ran on their two back feet. Pachycephalosauria - thick headed lizards. Small to medium sized dinosaurs that moved slowly on their back legs. Usually lived in herds.